Successfully tested with Lyon, Fiorentina, Chelsea and Sporting CP. Managed to win the domestic leagues on the 2nd season with both Lyon and Fiorentina. Defend like Jose Mourinho, attack like Carlo Ancelotti. A combination of Inter's 2010/11 defensive system with the counterattacking system of Real Madrid 2013/14. Won Barclays Premier League and the FA Cup in my 3rd season with West Ham, with this FM15 tactic. I have created a FM15 tactic for Atletico Madrid and have managed to win the league and cup double with them in the 1st season! A modern deep, compact, counterattacking 4-4-2 tactic for Football Manager 2015, inspired by Diego Simeone's Atlético Madrid. On the latest installment of Tactical Tuesday, I use Dortmund and try to find a system that suits them best in Football Manager 2015. This FM15 tactic was successfully tested with Real Madrid on 15.3.2. Originally created by CroMadridista for FM14. I have used this formation for years in my long term save (currently in the 2035-36 season) and I have won the title for 14 years in a row and done an invincible season and also picking up many domestic and Champions League titles. 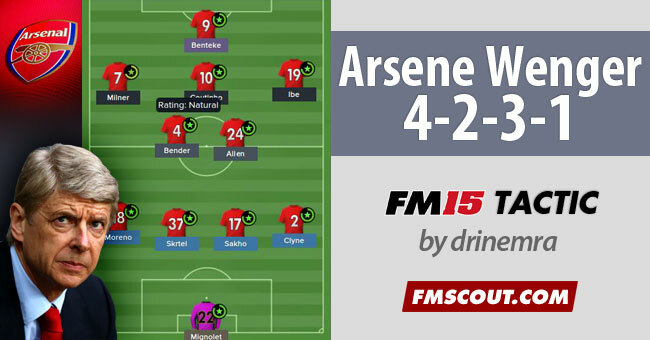 Trying to replicate Wenger's style of attacking football on Football Manager 2015. High possession and lot of clear cut chances. With this FM 2015 tactic I took Porto through the league season unbeaten, winning 1 domestic cup and being runner up in the other and also reaching the Champions League Semi's. A very fluid 4-2-4 attacking style for FM 2015 as used by Roberto Di Matteo in the Champions League quarter finals against R. Madrid. An attacking Football Manager 2015 tactic, successfully tested with Kongsvinger IL and Barca. Possession and shot happy asymmetric tactic for Football Manager 2015 created with standard Newcastle Utd team in mind. From Scotland fifth tier to the Premier League and Europa League glory with Spartans FC. Fast and direct style of play for Football Manager 2015.